Intelligent textiles are increasingly used by consumers in daily life. What helps astronauts in space and scientists in Antarctica can just as well provide some benefits for the average consumer. So-called temperature controlling Phase Change Materials (PCM) are used in many products in the meantime, for example in outer ware, under ware, socks, accessories, footwear, bedding, or sleeping bags. Some more “exotic” successes are the use in body armour, cars, or medical or specific industrial applications in which the heat or temperature management plays an important role. Not too warm, not too cold – just perfect. This is the simplest way to describe this technology. 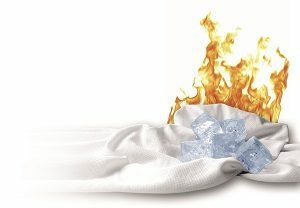 PCM textiles absorb excess body heat when too much is created and release it again to the body when needed. This influences the microclimate on the skin. Welcomed “side effect”: Sweating is reduced dramatically, temperature is balanced actively and dynamically. PCM textiles reduce overheating and shivering, the warmth is distributed regularly. Comfort is increased significantly. All day and night, the applications are many-facetted. Bedding (mattresses, comforters, pillows) for example: the body changes its temperature several times during night. PCM products guarantee for most comfortable sleep by avoiding overheating and reducing perspiration. The sleeping person can remain in the so-called REM phase (Rapid Eye Movement) for a longer time. Sleep is healthier and he wakes up more rested. During daily work routine: the body adapts much better to external temperature impacts thanks to PCM textiles. Comfort is enormously increased even in stress situations. Apparel, shoes and seat upholstery with PCM provide more comfort. Breathable products with PCM make it automatically easier to come inside or go outside and balance temperature fluctuations, e.g. when travelling, shopping, or during other activities. A study by Eidgenössischen Materialprüfungs- und Forschungsanstalt (EMPA), St. Gallen/Switzerland, discovered, that sweat production in apparel can be reduced up to a third. Shoes with PCM even reduce sweat production by up to 44 %. Anyone who actively works out knows the interaction: one sweats during the physical efforts and freezes easily during breaks. Quite the contrast with PCM textiles: one feels completely comfortable. Skiing is another example: normally you are getting hot very fast when you are active, but you are getting cold again just as fast when you are sitting in the ski lift and do not move. PCM can help here because they absorb and store excessive heat that is produced when you ski downhill. This heat is released again in the ski lift when you would normally start being cold. Motorcyclists are convinced of this technology too because of the completely different situations they can experience in quick succession: shady pieces of woodland, sunny sections, cool air flow during driving, and heat when stopping at red lights. PCM in Fibers: the capsules are located directly in the fibers. The fibers are spun into yarns being manufactured then into fabrics or finished products such as socks, underwear or knit wear. In-fiber applications are for products being worn next to or very close to the skin. PCM in coatings: A wide range of materials can be coated. For example many products (e.g. bedding) use non-wovens that have been coated. In outdoor jackets either the actual lining is coated or they can also be applied to mid-layers put between the first layer and the lining. In this case manufacturers are free to choose any design and first layer they want. Phase Change Materials always directly influence the micro climate between the skin and the respective product. How sensitive the human body reacts here becomes apparent when having a look at the narrow corridor you feel comfortable in. The average human body temperature is 36.6°C. The so-called core temperature of the inner body (e.g. heart, kidneys, CNS, etc.) is approximately 37°C and physiologically varies within narrow boundaries. The temperature of skin and limbs is usually lower and ranges from 28°C to 33°C, depending on the region. If the normal temperature of 36.5°C to 37.4°C gets only slightly higher or lower, it is either called fever or hypothermia. If this range is positively influenced by Phase Change Materials, the user´s comfort zone is kept more constant and hot and cold peaks are reduced.